In Italy, new agroforestry cultural models could play an important role in the diffusion of plantation forestry timber species. We studied the stem growth rates and leaf water potentials (Ψ) of common walnut (Juglans regia L.), and gravimetric soil moisture (θDW) depletion during the third and fourth growing seasons in an agroforestry trial in central Italy. Since the establishment of experimental plots in 1992, walnut was intercropped with alfalfa (Medicago sativa L.), with or without polyethylene (PE) mulching along tree rows. By the end of the study period, the unmulched-intercropped walnut was almost 68% smaller in stem diameter and height than the sole-unmulched control, demonstrating walnut’s sensitivity to alfalfa competition. The competitive effect of alfalfa on walnut stem growth was effectively controlled/reduced by PE mulching. Stem growth rates of mulched-intercropped walnut were always lower than the control, but much higher (ca. 235% in stem diameter and height) than those of unmulched-intercropped walnut. 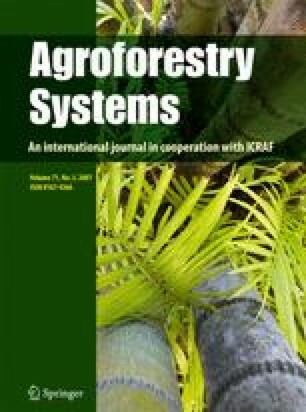 The higher field performance of mulched-intercropped walnut compared to the un- mulched-intercropped treatment was associated with higher soil moisture and predawn and midday Ψ values during the summer’s driest periods. The presence of PE mulching was also associated with lower levels of soil moisture during the early and late growing season, but this did not negatively affect walnut Ψ and growth rates. These results suggest that in the climatic conditions of central Italy, competition for soil moisture between young common walnut trees and alfalfa can be substantially lowered, but not completely eliminated, by PE mulching. This revised version was published online in November 2005 with corrections to the Cover Date.